"Go On With Your Bad Self"
(1978) "Ease on Down the Road"
(1978) "Pops We Love You"
Two versions of the song have been released as charting singles: one associated with the Broadway show by studio group Consumer Rapport in 1975, and a second recorded by Diana Ross and Michael Jackson for the 1978 feature-film adaptation of The Wiz. The song was performed in the original Broadway production by Stephanie Mills (Dorothy), Hinton Battle (Scarecrow), Tiger Haynes (Tin Man), and Ted Ross (Cowardly Lion), who also perform the song on the original 1975 cast album for The Wiz. The song was a number-one disco hit for five non-consecutive weeks in a recording by the disco studio group Consumer Rapport. Produced by Stephen Y. Scheaffer and The Wiz musical arranger Harold Wheeler, the Consumer Rapport version hit the Billboard Soul Singles chart, peaking at #19 and the Hot 100, peaking at #42. 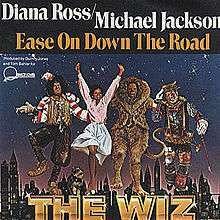 In 1977, "Ease on Down the Road" was recorded as a duet between Diana Ross and Michael Jackson and released as the theme song of the 1978 film adaptation of The Wiz. As with the rest of the music in the film, the film version of "Ease on Down the Road" was produced by Quincy Jones. The recording was one of Jackson's first collaborations with Quincy Jones, who became his main producer during the late 1970s and 1980s. Released as a single by MCA Records in late summer 1978, the song missed the U.S. Top 40 by one position, peaking at #41 on the Billboard Hot 100. It reached #17 on the Billboard Hot Soul Singles chart the same year. Allmusic's William Ruhlmann wrote that duet between Jackson and Ross has "spectacular vocal firepower" and that it outperforms the 1975 version by Consumer Rapport. The recording also earned Jackson his first Grammy Award nomination with Ross (his previous two were with his family group, The Jacksons) in the category of Best R&B Performance by a Duo or Group with Vocal in 1979. In 1980, Jackson was a guest on Kraft Salutes Disneyland's 25th Anniversary and, along with Disney characters (Mickey Mouse, The Seven Dwarves, Donald Duck, Pinocchio, Minnie Mouse, Chip 'n' Dale, Pluto, Winnie the Pooh, The Three Little Pigs and Goofy), performed the song in a medley with the Disney signature song, "When You Wish upon a Star". Della Reese performed the song in the 1975 episode "Della, Della, Della" of the comedy program Sanford and Son along with Fred Sanford. In 1980, The Muppet Show featured the song during episode 510, in a bizarre retelling of Pied Piper of Hamelin. In 1977, the song was performed by the cast of The Brady Bunch Variety Hour in a bizarre skit based on Pinnochio. Stephen King references the song in the Dark Tower novel The Gunslinger. The song appears in NBC's 2015 production of The Wiz Live!, performed by the TV special's stars Shanice Williams, Elijah Kelley, Ne-Yo, and David Alan Grier. In 2015, Saturday Night Live cast members Sasheer Zamata, Michael Che, Jay Pharoah, and Kenan Thompson sang part of the song, while respectively portraying Dorothy and her friends in a crossover between The Wiz Live! and the 1939 movie The Wizard of Oz. At the end of the sketch, they sang it again while teaching the 1939 Scarecrow (played by Ryan Gosling) how to dance the Dab. 1 2 Thomas, Leah (3 December 2015). ""Ease On Down The Road" Performances In 'The Wiz Live!' Will Have The Famous Song Stuck In Your Head All Week". Bustle. Retrieved 6 December 2015. ↑ "'Ease on Down the Road' by Consumer Rapport Hit". The Pittsburgh Courier. 21 June 1975. Retrieved 6 December 2015. ↑ Whitburn, Joel (2004). Top R&B/Hip-Hop Singles: 1942-2004. Record Research. p. 132. ↑ William Ruhlmann (1978-09-18). "The Wiz [Original Soundtrack] - Original Soundrack | Songs, Reviews, Credits". AllMusic. Retrieved 2016-09-10. ↑ Whitburn, Joel (2004). Hot Dance/Disco: 1974-2003. Record Research. p. 63. ↑ ""Sanford and Son" Della, Della, Della (TV episode, 1975". IMDb.com. Retrieved 2016-09-10. ↑ "YouTube: The Brady Bunch Variety Hour: Pinnochio". Retrieved June 6, 2014. ↑ Nichelson, Ted (2009). Love to Love You Bradys: The Bizarre Story of the Brady Bunch Variety Hour. ECW Press. p. 291. ISBN 9781550228885. ↑ "Watch The Wiz From Saturday Night Live - NBC.com". 6 December 2015. Retrieved 4 February 2016.